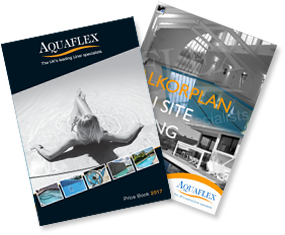 Temperature and pH of the swimming pool water have a major effect on the liner absorption. The two graphs show the results of multiple measurements of the weight of samples of liner material that have been kept under different conditions and for different periods in swimming pool water containing 1-2ppm of chlorine, 30-50ppm of stabiliser. The absorption will make the liner material want to swell. As long as the liner cannot slip on its support (and form creases) only its thickness will increase. An absorption up to 5% is normal and will not provoke any wrinkling. 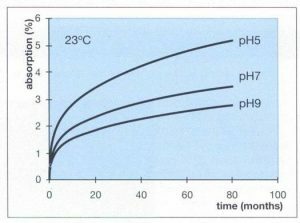 In order to avoid excessive absorption, pH should never be lower than 7.2 and temperature not above 33°C (91°F). 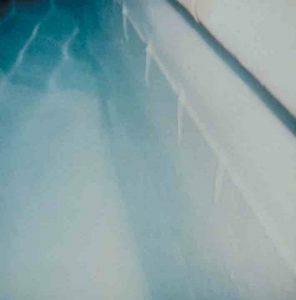 Growth of material causes creasing: Water treatment conditions, (pH, temperature, pollution of water, level of water treatment chemicals) determine the level of absorption and thus the growth of the liner. This has a major influence on creasing. Lower friction causes creasing: Concrete floors or those covered with a felt have a normal friction co-efficient while smooth surfaces such as metal or plastic wall panels, have a lower resistance to slip as a small film of water can easily build up between the liner and the panel. Rigidity of liner causes creasing: High levels of chemicals and/or incorrect pH will make the liner less flexible. This raises the internal tensions and increases the risk of creasing. Water trapped behind the liner causes creasing: The amount of water this is pressing the liner against its support also has an influence on the risk of creasing; more important though is the amount of water present behind the liner as this not only compensates the pressure of the water inside the pool but also can decrease slip resistance of the liner. If creasing has occurred mainly due to poor water treatment, then the distance between creases will be small (1cm to 15cm). However, when the pool shell has low resistance against slip or when there is a significant quantity of water trapped behind the liner, the distance between creases will be greater (more than 30cm). With the foregoing facts in mind, it is possible to evaluate the cause of the wrinkling when inspecting a problem pool. The distance between folds is quite small and the estimation of total growth of the liner gives a very high level of moisture and chemical absorption. This kind of wrinkling indicates that the material has been severely attacked by chemicals. When chemicals are thrown directly into the pool and are not correctly dispersed, they tend to concentrate on the deepest part of the pool which creates, locally, very very high concentrations of chemicals. When slow dissolving tablets are placed in the skimmer, they continue dissolving even when the circulation pump is not working. If this situation continues over a long period, the chemicals will find their way through the pipe work and will enter the pool at the bottom outlet. This also creates high chemical levels in the deepest part of the pool. Chemicals should always be thoroughly mixed with water in a bucket before being added to the pool water. In this case, estimation of liner growth gives a lower value than previously described but is still considerable. The distance between creases is also greater. In this instance, the liner has grown due to excessive chemicals (often accompanied by discolouration) or high temperature (no discolouration). However, this alone is not enough to cause wrinkling. It is likely that the water has accumulated behind the liner. This has lowered the slip resistance of the liner against the pool shell which has allowed creases to form. The liner material on the wall resists creasing a little better as this material is stretched when put into the pool but with the liner on the floor growing and forming creases, the wall material has moved upwards which then creates folds beneath the skimmer and inlets. After the ground or trapped was has dissipated the creases will remain. Flash flooding of the pool site can occur if there is inadequate site drainage. Water will temporarily build up behind the liner and cause it to lift. 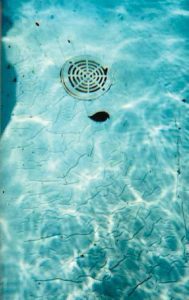 When the water dissipates it can leave the liner out of position with creases anywhere on the liner, especially beneath the pool fittings.